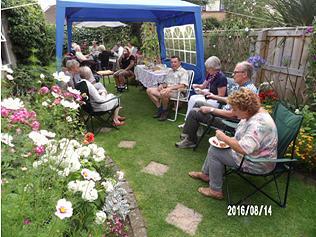 The Treasure Hunt was organised by Heather and Neil Robinson followed by the annual BBQ hosted by Dave and Kate Simpson. 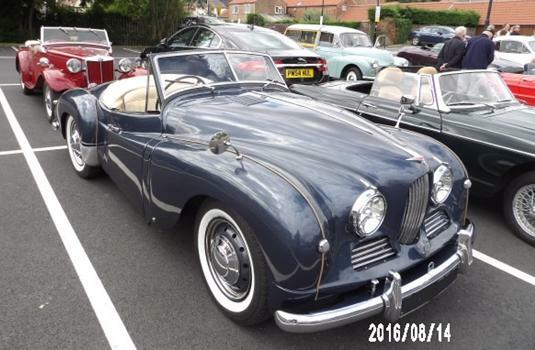 Nine cars met Heather and Neil Robinson at 1pm in Thirsk with Dave joining us to take some photos and collect a trifle from Jean Culmer. There were quite a few members that had not experienced a Treasure Hunt run before and they surprisingly left with enthusiasm and confidence, while the seasoned members left with trepidation, particularly Tony and I who always seem to have the worst score. I put this down to Tony's speed while we are working out the questions or it could be my lack of skill when it comes to working out clues! The run was 56.7 miles taking in the Thirsk, Rainton and Bedale areas finishing at Normandy Road at approximately 4pm. We all waited while Neil marked the Treasure Hunt papers and am pleased to say Karen I'Anson and team were the winners, I was delighted that Tony and I were not last!! Dave was busy cooking the BBQ and Kate organising the salad and dessert table. 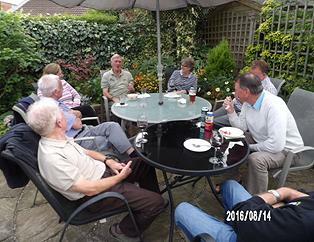 We were soon enjoying our food, drink and a good chat. Thank you to those involved in the organisation of this very successful event.